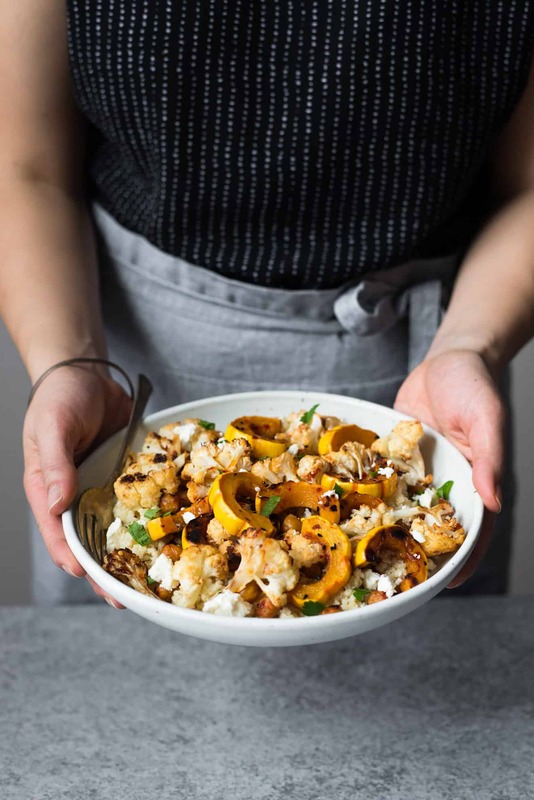 This harissa roasted cauliflower with delicata squash and chickpeas is a spicy and sweet sheet pan meal that’s great for weeknights. For a heartier meal, pair the roasted vegetables and chickpeas with your favorite grains, such as millet, rice or quinoa! This roasted cauliflower dish is something that I threw together when I had no idea what to cook for lunch one day. I stared into my refrigerator, and the only things that caught my eye were a head of cauliflower, a jar of harissa and maple syrup. That’s when the magic happened. It threw in some delicata squash for carbs and chickpeas for protein and I was surpised how well my impromptu meal tasted! I had to share the recipe with all of you. Hope you enjoy it as much as I did! Harissa is a chili paste that is very common in North African and Middle Eastern cuisine. It’s usually made from a blend of hot chili peppers, garlic, cumin, caraway seeds, salt and a bit of oil. You can add this flavorful hot sauce to pretty much any savory dish. I often add 1 to 2 tablespoons of harissa to my roasted vegetables. I have also added harissa to pasta sauces and stews for extra spice. It is a very versatile ingredient. You can find harissa in jars, tubes or cans. I have also seen harissa as a dried spice blend. For this roasted cauliflower recipe, I am using Mina spicy harissa, which I see most commonly at the supermarket. Mina’s harissa is much thinner (more runny) than the traditional chili paste. That’s actually one of the reasons why I like cooking with it because it is easier to combine with other ingredients. If you are using a more traditional, thicker harissa, I would use about 3 tablespoons total for the entire recipe. Roasted chickpeas: The roasted chickpeas taste amazing when they’re fresh out the oven because they’re still very crunchy. Unfortunately, they will not retain that crunch the next day. If you like the crunchy texture of the chickpeas, I recommend eating as many as you can the day you bake them! For this recipe, I used 4 tablespoons of Mina’s spicy harissa, which is thinner and more runny that traditional harissa pastes. If you are using a paste, I recommend using about 3 tablespoons total for the recipe. If you can’t tolerate much spice, use 2 to 2 1/2 tablespoons of the harissa paste. If you are using a dried spice blend, I would use about 1 tablespoon to 4 teaspoons of the spice. It depends on the spiciness of the blend. Preheat the oven to 400 degrees F (205 degrees C). Position the oven racks to the upper third and lower third positions. Line 2 large baking sheet pans with parchment paper or silicone mats. (I used one of my full-sized, 15″x21″ pans to give the cauliflower room to roast properly. Set pans aside. Rinse the cauliflower. Cut it into smaller florets (video tutorial). Add the florets into a large bowl and set aside. Rinse the delicata squash. Slice off the ends of the squash. Then, slice it in half, lengthwise, so that you have 2 long halves. Using a spoon, scoop out the seeds and strings. Slice the squash halves into 1/3-inch thick half-moon slices. Add them to a medium bowl. Drain and rinse the chickpeas. 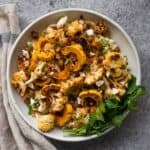 Add them to the bowl with the delicata squash. In a small bowl, mix the olive oil, harissa, maple syrup and salt until well incorporated. Pour half of this harissa mixture into the bowl with the cauiflower and the remainder with the squash and chickpeas. Stir to coat the vegetables and chickpeas with the saucy mixture. Spread cauliflower, squash and chickpeas over your sheet pans. Make sure that your vegetables (particularly the cauliflower) are not crammed together. Otherwise, they will just steam rather than roast in the oven. If necessary, roast in batches. Roast everything for 30 to 35 minutes, until the vegetables and chickpeas have browned. Swap the position of the sheet pans halfway through the cooking time. If, at the end of 35 minutes, your vegetables are not roasted enough, leave them in the oven for another few minutes. 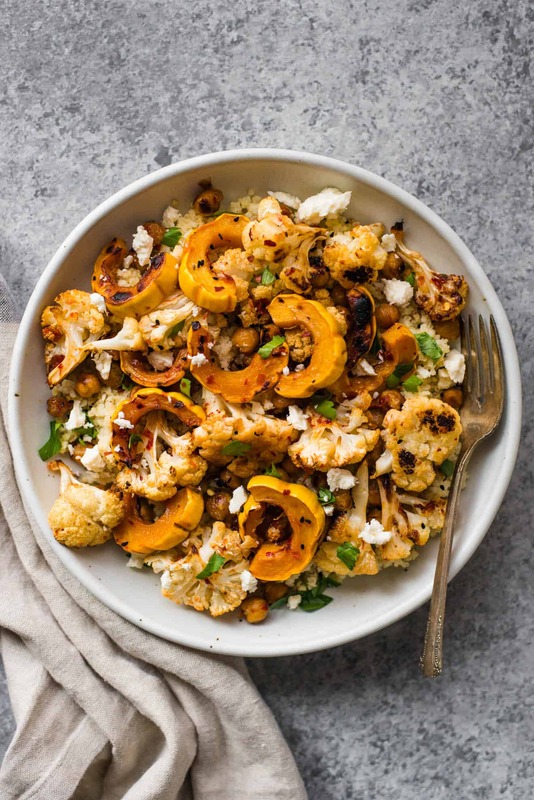 Serve the roasted cauliflower, squash and chickpeas with your favorite grains. Sprinkle with crumbled feta, chopped parsley and nigella seeds, if you like. The color of your baking sheet pans can also affect the cooking time. Things tend to cook quicker on dark baking sheets. Check the vegetables at about 30 minutes to see if they have been roasted to your liking. The garbanzo beans are crunchy when they first come out of the oven but don’t retain their crunch well the next day. 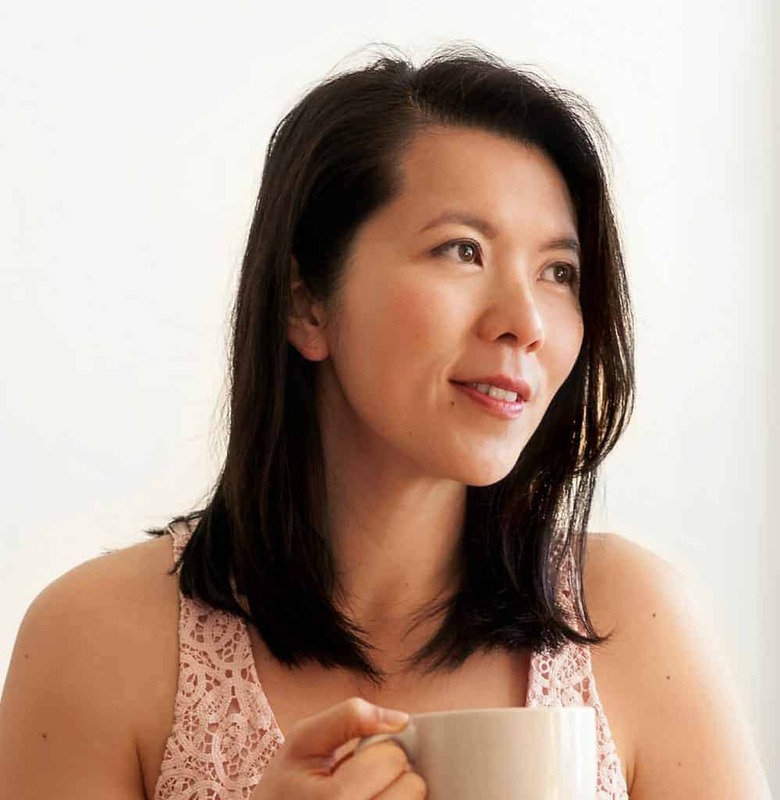 **I know that nigella seeds are difficult to find, but I was totally having an Ottolenghi moment when I styled the dish. 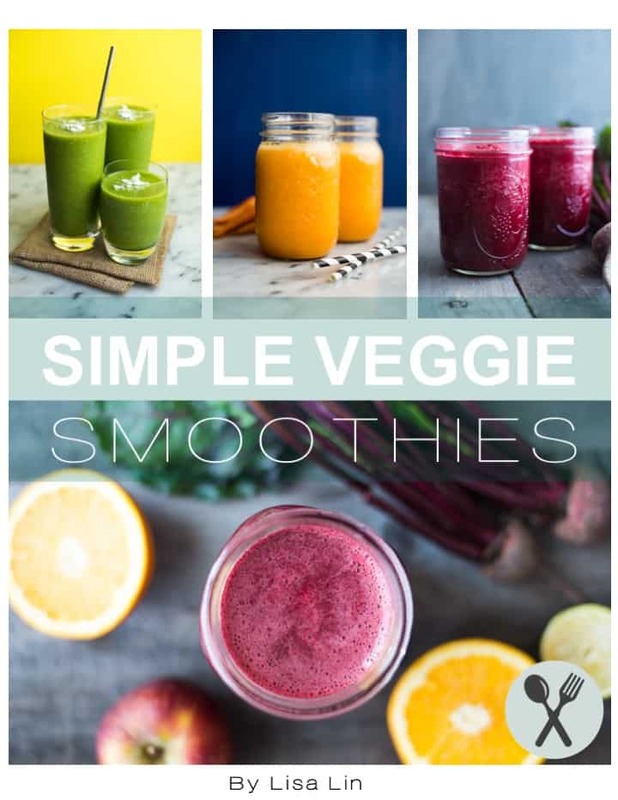 This recipe is great even without the seeds. 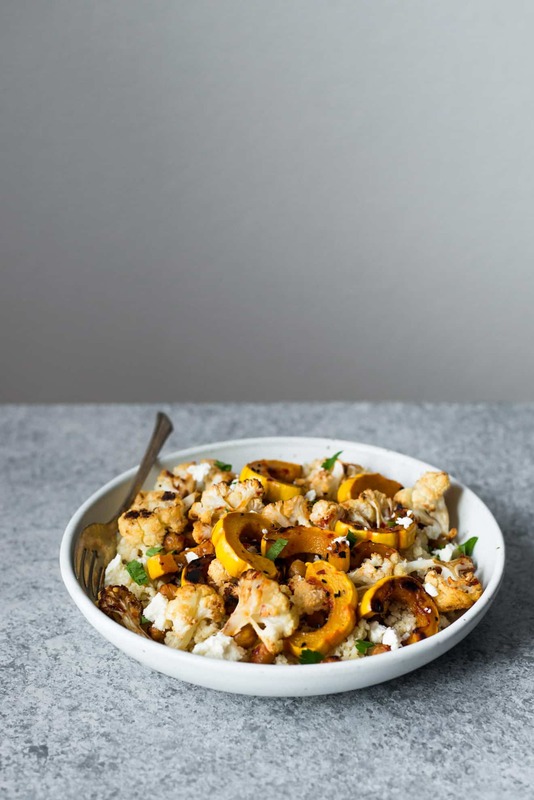 Aaaaaagh the cauli + harissa + delicata squash?! I’m in love with this beautiful combination! I find the best lunches and dinners come from tossing together what’s already in the refrigerator…for some reason the fridge cleanout creates this lack of pressure, and the result seems to always jive. Magic, indeed. I definitely need to try this out!